Canyon Regional Water Authority (CRWA) is a major provider of high quality potable water for thousands of consumers North East of San Antonio onward to the city of San Marcos, TX. Over the past few years this corridor has seen significant growth, and this growth pattern continues. 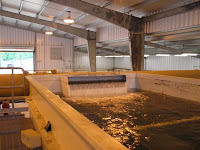 CRWA operates two surface water treatment plants with a total capacity of greater than 22 MGD. CRWA worked with its member entities to develop for the first time, a groundwater well field and treatment plant tapping the Carrizo/Wilcox Aquifer in Gonzales and Guadalupe counties. This aquifer offers high capacity flows but does contain moderate iron with low manganese content. The project, known as the Wells Ranch Project, consisted of seven new wells, twelve miles of transmission lines, storage and booster stations, as well as a new 6 MGD state of the art treatment facility. After an in-depth evaluation, the Authority together with River City Engineering selected Tonka Equipment Company to supply the new plant’s filtration system. Tonka furnished four 10’ wide by 40’ long, 4 cell GVS gravity filters, loaded at 3gpm/sf. Tonka also included all the valves for process operation and PLC controls, for a complete treatment system. Tonka’s gravity filters were selected for this project due to their ease of operation, which provided an easy transition for plant personnel familiar with traditional surface water plant filter operation. The new filters incorporate Tonka’s Simul-Wash™ backwash process, which, in addition to keeping the media in top condition, will reduce the amount of backwash waste the facility generates by more than 50% over conventional backwash processes on the market. At design capacity this process will save over 9 million gallons annually, guaranteeing additional revenue: water that would have been wasted can now be sent into distribution. Using gravity to save on costs In addition to the water savings, the Wells Ranch Project also utilized the natural slope of the land, along with some engineered site grading, resulting in a totally gravity driven facility. All of the wells pump into a raw water receiving tank, where chlorine and lime are fed. Water then flows through Tonka’s gravity filters and into a ground storage tank, for final pumping into the transmission lines. Tonka is proud to have CRWA as another satisfied customer.